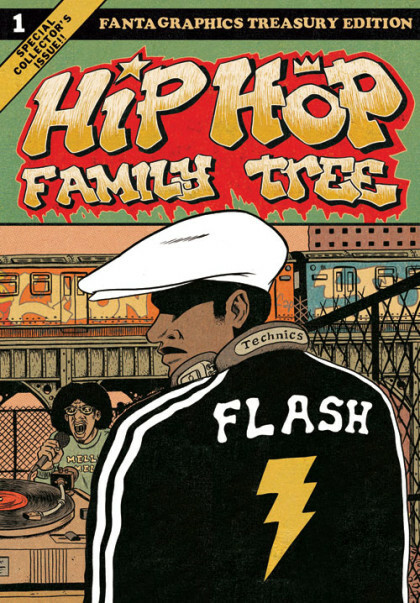 SETH’S PICK :: HIP HOP FAMILY TREE GN: Astute readers of the Heroes Blog will remember that I interviewed cartoonist Ed Piskor about this very book back in May. If you missed it the first time, you can find that HERE. As I noted in that interview, I’m not a huge fan of Hip Hop, nor do I have a great deal knowledge of its rich history. I am, however, a fan of great cartooning, and of the possibilities that exist when combining the seemingly disparate arts of comics and music. Having finally seen the book in person, I can tell you that I haven’t encountered another musical chronicle quite like it in the realm of comics. The strength of the book isn’t merely represented by Piskor’s authoritative knowledge of the music’s history, but in how his art puts you right in the middle of the lives of the artists who were breaking new musical ground. Whether you’re a fan of Hip Hop or just curious about its varied history, this first of a several volume series from Piskor is a comic deserving of your time, money, and enthusiasm. This is honestly one of the most significant new graphic novels I’ve seen this year. Give it a look and I’m sure you’ll agree with me. I did get to see a copy of the anthology but never magenad to get my hands on one for my very own. It looked pretty great though. Thanks again for inviting me to submit to it.